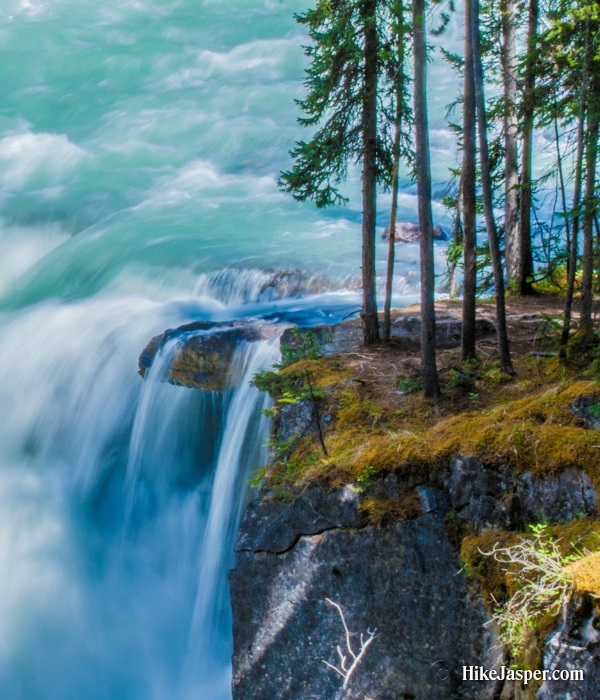 Sunwapta Falls in Jasper National Park is a beautiful experience. 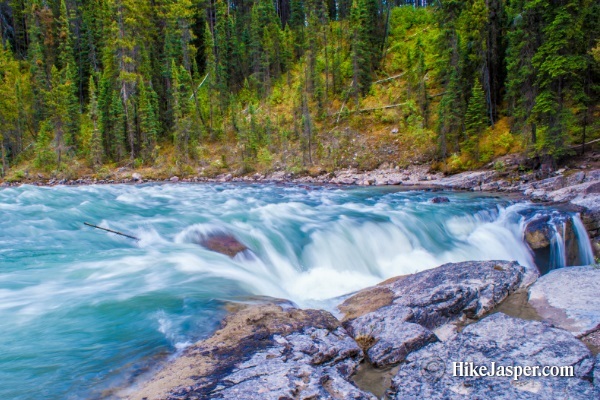 In 1892, AP Coleman gave Sunwapta Falls' name the Stoney Indian word for "turbulent river". 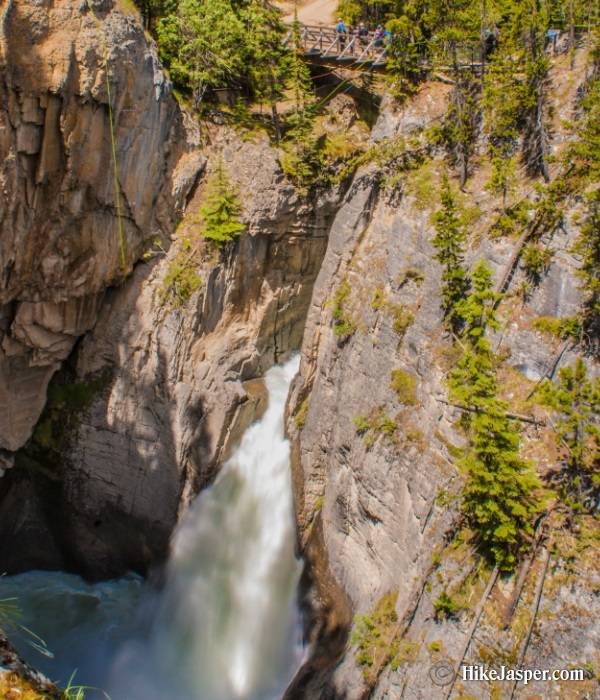 While this is a bit less of a hike and more of a viewing experience, you can place a fair amount of time hiking in Sunwapta Falls' areas, taking in the many different views of this amazing waterfall and canyon. Hiking Time Plan to spend 1/2 to an hour to hike, view and fully enjoy Sunwapta Falls and Canyon. 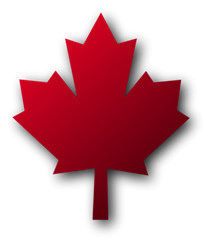 Drive south of Jasper on Hwy 93 (The Icefields Parkway) for 55km and turn right at the Sunwapta Falls Resort. The parking lot is at the end of the access road. There are picnic tables, bathrooms and garbage cans around the area. It may be busy during the day, but is a great spot for an early evening picnic. From the parking lot, hiking down to the viewing bridge over the canyon will afford very nice views of Sunwapta's main waterfall. The hiking trail to Fortress Lake leads off in to the forest on the other side of Sunwapta's bridge. 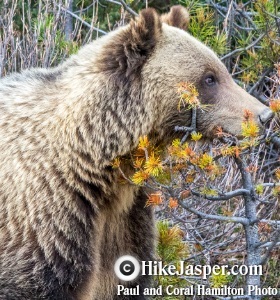 >> This trail is a considerable hike, not typicaly for those viewing Sunwapta Falls. The best view of Sunwapta's waterfall below the viewing bridge is from the edge or rim of the canyon. 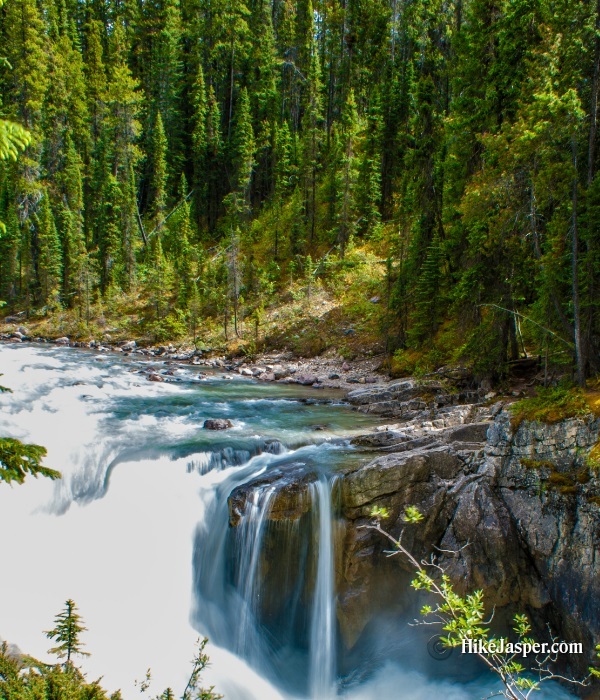 If you desire to see more canyon and waterfalls, simply follow the well marked Lower Sunwapta Falls hiking trail. Details are below. Hiking the canyon to the lower sunwapta falls is a great way to extend enjoyment of the Sunwapta Falls area of Jasper National Park. The hiking trail is downhill on the way in but it's a gentle climb back up. This short hike is definitely worth the time. For the perfect view of the lower sunwapta falls, stacked one above another, it is necessary to scramble a bit down a steep bank below the last fall. Please be careful as this area can be extremely slippery when wet. Hike downstream of the parking lot along the canyon, NOT crossing the viewing bridge, as that again is the trail to Fortress Lake. The hiking trail sign is beyond the end of pavement where the trail turns to the right. Follow this hiking trail downstream for just over a kilometer. This route will offer several spots to view the canyon below. 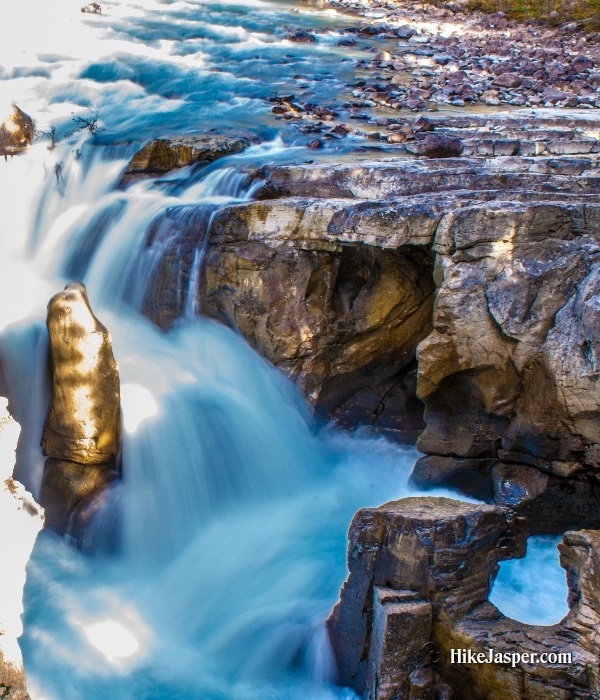 Sunwapta's lower falls are unmistakable and mark the end of the trail. Below the last waterfall the canyon will end and the river bed reverts to a boulder filled stream.